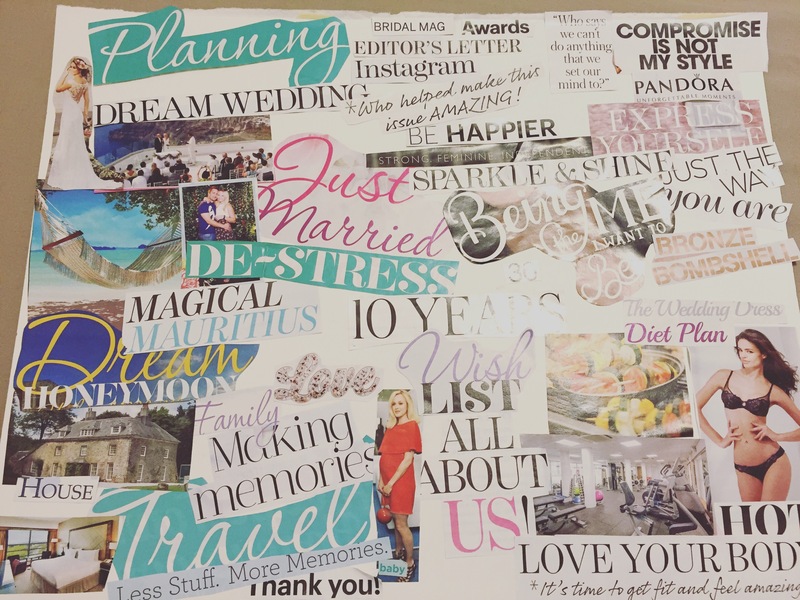 So this evening has been spent cutting up my vast collection of Glamour and Wedding magazines to create a vision board. For those that aren’t aware what this is, it’s basically putting your dreams and wishes for the future into a collage in order to motivate you to achieve your goals. I was first introduced to the concept by my aunt who is a spiritualist, on a visit to her home in Canada. This is my second attempt as my first didn’t quite go to plan. I find it hugely motivating to be able to see exactly what it is I want so I can plan how I am going to get it. The main goals are the wedding, honeymoon, creating memories with my little family, and at one point expanding the family with another little baby, getting fit and healthy to feel happy with my body and then working on my career to ensure I am happy in my work life. Lots to be keeping me busy over the next 10 years!